Can blue chip stocks be part of your winning investment strategy? A successful long-term approach to investing is to pick winning dividend stocks to hold forever and as you probably know, it’s a lot harder to do for a consistent period of time than you can imagine. Many investors and stock analysts will share their opinion on many different stocks but the reality is that there are proven businesses with a long history of growth and success through good and bad times. Those blue chip companies often have a leg up on the competition and lead the way with consumers for recognition. The company is a leader in both market capitalization within its sector, its country and in its business segment. The company will often have products that are well-known to everyone and established within the household. The company will often pay a dividend and have paid a dividend consistently for many years. While it’s not required to pay a dividend, or have increased the dividend, they usually have established the pattern. Blue chip stocks are considered to be more defensive with the ability to weather stock market storms. It doesn’t mean the stock price will not go down, it means they are expected to recover due to their established business and strong foothold. The blue chip reference comes from understanding that a blue chip is the most valuable poker chip if you are curious about the reference. Watch this video for a great explanation. Stay on top of your next investment decision with the Dividend Snapshot Canadian Dividend Performance List. Review the Chowder Rule along with the 3, 5, and 10 year ratios for dividend growth, EPS growth and the payout ratio to pick a solid investment for your portfolio. Here is what I consider to be the complete list of blue chip stocks on the Toronto Stock Exchange. 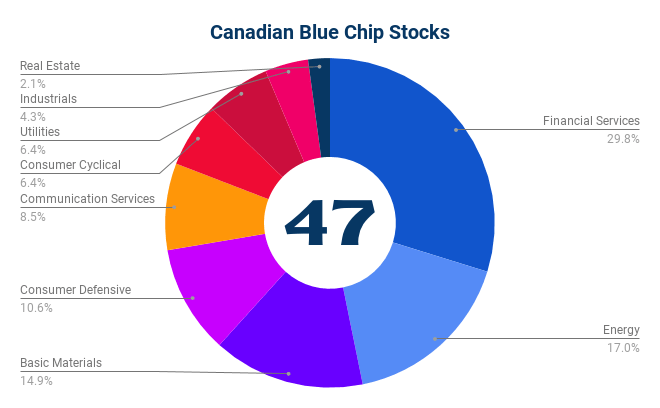 I identified a total of 47 blue chip stocks from the Toronto Stock Exchange. The top two rows below can be considered blue chip stocks for beginners and are easily the best blue chip stocks examples for Canadians. The list outlined below is sorted by market capitalization and could be considered blue chip stocks for beginners. I own a number of the stocks listed, see my stock holdings for more details. All data points are accurate as of the time of writing. What you may find interesting is that many of the Canadian Dividend Blue Chip Stocks also trade on the NYSE as cross-listed stocks. Please note that from a market capitalization perspective, none of the Canadian REITs have made it on the list below. The following list represents Canadian dividend stocks to hold forever – if you were to evaluate the holdings of many ETFs or mutual funds, you would find those companies. You will notice that the top 10 Canadian dividend growth stocks are heavily focused on financials and energy. That can almost sum up the Canadian economy in general. The list of US blue chip stocks would vary and they would be much larger in market capitalization. Consider how important investment diversification is a dividend income portfolio. Royal Bank continues to maintain the largest market capitalization with TD continuously on its tail for the largest company in Canada. Most of its business is in Canada but it has international exposure in the wealth management segment. Toronto Dominion Bank is a leading Canadian bank providing banking products and services in Canada and the US. It is the fifth largest bank in North America by total assets. The bank was formed as a result of amalgamation of The Bank of Toronto and The Dominion Bank in 1955. Retail earnings accounts for more than 90% of TD Bank’s total earnings. The bank operates through three business segments: Canadian retail banking (53% of latest income), U.S. retail banking (47%) and wholesale banking. TD Bank offers a wide range of retail, small business and commercial banking products and services to more than 25 million customers worldwide and almost 13 million digital customers. Toronto Dominion bank operates through more than 1,250 locations along the Northeast, Mid-Atlantic, Metro DC, the Carolinas and Florida. It enjoys #1 or #2 market share positions for most of its retail products in Canada. The bank operates in four of the top ten metropolitan areas and seven of the ten wealthiest states in the U.S.
Scotiabank is a leading international bank in Canada and a leading financial services provider in the Americas. The bank has a presence in personal and commercial, corporate and investment banking, wealth management and capital markets, and serves 25 million customers worldwide. With a rich history of 185 years, the bank has developed an extensive network of over 960 branches and more than 3,600 automated banking machines in Canada, and 1,800 international branches. Scotiabank has a wide geographic presence in attractive markets in Latin America (71% of revenues), Caribbean & Central America (25%) and Asia (4%). It operates through Canadian banking (49% of earnings), international banking (36%) and global banking and markets (15%) business lines. Scotiabank is highly diversified by products, customers and geographies, which reduces risk and volatility. The bank generates nearly 80% of its earnings from high quality and stable businesses which gives stability to cash flows. Canadian National Railway is a leading transportation and logistics company in North America. The company owns the only transcontinental railway line in North America and provides intermodal, trucking, freight forwarding, warehousing and distribution services. As North America’s leading supply chain player, Canadian National Railway carries more than 300 million tons of cargo annually. It is a fully integrated rail and transportation services company and is the top mover of aluminum, iron ore and base metal ore in North America. Canadian National handles over 50% of all Canadian chemicals production and services the three major petrochemical centers in North America. Its product portfolio is well diversified with intermodal accounting for 25% of revenues, followed by petroleum & chemicals, and grains & fertilizers each at 17%. Forest products, metal, minerals, automotives, etc. constitute the remainder. The company transports goods worth more than $250 billion annually for a wide range of business sectors, ranging from resource products to manufactured products to consumer goods. Suncor Energy is one of the largest independent energy companies in the world engaging in oil sands operations, offshore oil and gas production, petroleum refining and marketing. It is the largest oil producer in Canada. The company has operations across the entire value chain, including resource extraction, upgrading, refining and marketing, and midstream logistics. In addition, Suncor is involved in energy trading and operates a renewable energy business. Suncor owns offshore assets in key strategic geographic locations like the U.K. North Sea, Canada’s east coast and Norway. The company operates four refineries, an ethanol plant, wind farms, and over 1700 retail sites in North America and owns 940 mbpd oil production, 550 mbpd upgrading, and 460 mbpd refining capacities. Suncor’s long-life, low-decline reserve base with a proven life of more than 30 years, sets it apart from peers. Bank of Montreal is the eighth largest bank in North America by assets. It provides diversified financial services and products in personal and commercial banking, wealth management and investment banking segments, to a wide range of customers including more than 12 million individuals, businesses, governments and corporate customers across Canada and the U.S. By geography, Canada is its largest market accounting for over 60% of net income, followed by the US (28%) and other countries (9%) like Europe, Asia, the Middle East and South America. The bank has a strong presence across regional economies and markets around the world and is in a good position to address the growing cross border needs of corporate customers. It owns a network of more than 900 branches and ATMs and operates through Canadian Personal and Commercial Banking (41% of net income), U.S. P&C (23%), BMO Wealth Management (18%) and BMO Capital Markets (18%) operating groups. Powered by industry-leading investments in advanced networks and media content, Bell communications services are offered under the Bell and Bell Aliant brands. These include fiber-based IPTV and high-speed Internet services, 4G LTE wireless, home phone and business network and communications services, including data hosting and cloud computing. Bell Media is Canada's premier multimedia company with leading assets in television, radio, out of home and digital media, including CTV, Canada's #1 television network, and the country's most-watched specialty channels. Enbridge exists to fuel people's quality of life and has done so for more than 65 years. A North American leader in delivering energy, Enbridge has been ranked on the Global 100 Most Sustainable Corporations index for the past eight years. Enbridge operates the world's longest crude oil and liquids transportation system and is a North American leader in the gathering, transportation, processing and storage of natural gas. Enbridge is Canada's largest natural gas distribution provider, with about 3.6 million retail customers in Ontario, Quebec, New Brunswick and New York State. Enbridge has interests in nearly 3,000 MW of net renewable generation and power transmission capacity, based on projects in operation or under construction, and continues to expand into wind, solar and geothermal power. TransCanada Pipeline is a leading North American infrastructure company. It supplies more than 25% of natural gas consumed daily across North America. The company has a strong portfolio of diversified assets, storage facilities and power generation plants and operates one of North America’s largest natural gas pipelines networks extending to more than 57,500 miles. TransCanada operates three complementary energy infrastructure businesses across three major geographies in North America. By generation type, TransCanada’s assets can be divided into nuclear, natural gas and wind. The USA, Canada and Mexico are its core geographies and the company has access to North America’s two most prolific natural gas supply basins. With more than 65 years of service, TransCanada is known for delivering energy in a safe and sustainable manner. Ownership of low-risk regulated cost-of-service businesses and long-term contracted energy infrastructure assets differentiate TransCanada from its peers. Canadian Natural Resources is a large natural gas and crude oil exploration and production company in Canada. The company operates a diversified portfolio of assets (comprising of mix of natural gas, light crude oil, heavy crude oil, bitumen and synthetic crude oil) in North America, the UK North Sea and Offshore Africa. Canadian Natural’s business can be broadly classified into - North America E&P, international, marketing & midstream. The company holds some of the best oil sands assets in North America, particularly thermal in situ properties, having significant growth potential. Canadian Natural completed its transition to a long life, low decline asset base in 2017, which ensures a growing base of sustainable cash flows especially in low commodity price environments.